Promises that the new Rainbow Road is "spectacular"
As this is Mario Kart 8 day, or so it seems, there are some more snippets emerging from a GDC (Game Developers Conference) group interview held by game producer Hideki Konno in March. We've already heard details on why a custom track creator hasn't been included, and Gamespot has now pitched in with some additional snippets from that interview. 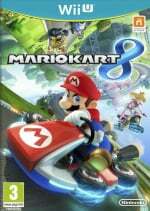 In this case Konno-san tackles the perception that the Mario Kart franchise — at least in recent generations — is largely based on luck; the brutal item distribution in Mario Kart Wii certainly contributed to this perception. Although our time with Mario Kart 8 prompted its share of humorous shakes of the head and expletive-laden rants, arguably part of the beauty of the series, the new entry does seem nicely balanced and relatively fair, at least based on the build we played. Konno-san said the following when emphasizing that a great deal of effort goes into the balancing for the kart racing series, in order to avoid accusations of unfairness or an excessive reliance on good fortune. Game balance is also another really important element of Mario Kart that we look very closely at and place a lot of value on. From the time we start working on development, thousands of times, maybe even tens of thousands of times, we adjust that balance when we're playing. At the end we come up with what we hope and feel is a really good balance. It's our strong hope that folks would want to play with the items as we have balanced them. We do hear, and a lot of people out there say it, that Mario Kart is all about luck. That if you're at the front then you'll get hit with a blue shell, so it's all about luck. That feature is not random — it doesn't just happen. There is a lot of adjustment and there is a lot of thought and effort put into that system, and developing it in a way that actually promotes game balance. I would hope people understand that as well. 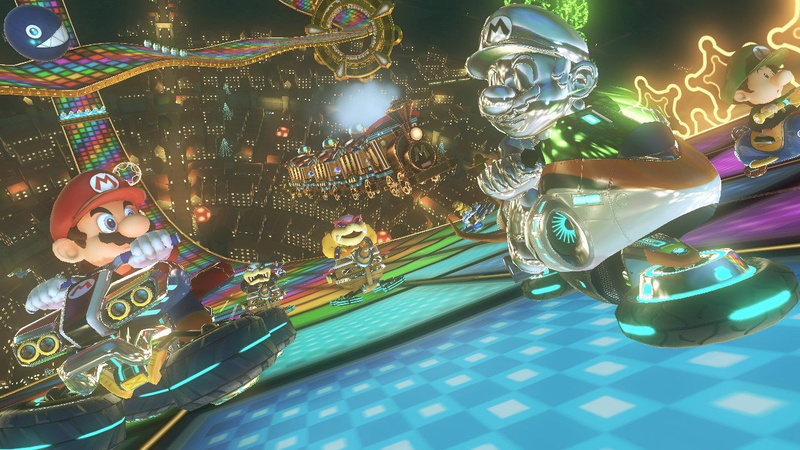 In the same article Konno-san states — as we now know from the latest trailer, below — that the Rainbow Road track from Mario Kart 64 is one of the remixed tracks. As per tradition there'll also be a new Rainbow Road, and the producer had no hesitation in talking it up. Rainbow Road of course is a classic course. This time we actually grabbed Rainbow Road N64 version in addition to the current iteration of Rainbow Road. So we hope you look forward to racing on both of those courses. One thing I do want to mention is Rainbow Road, that final course. We really want you to look forward to what we've done to it this time because it's something else. It's really spectacular. We suspect it'll be one of the last tracks revealed prior to the title's launch; with anti-gravity, flight and underwater driving all possible there's plenty of scope for an outlandish design. As for the overall balance promised by Konno-san, one thing is unavoidable — no matter how well balanced it is, there will be rage; that's Mario Kart. I'm so hyped I can't wait for this gem!! The balance issue they're focusing on making the game fun and fair. I already know I'm going to love and rage at the same time with this game. I did it with all the MKs. LOL Morton salt "when it rains.....it pours!" That will describe me when someone waits for me to jump a cliff and hits me with lighting, or get bombed with a blue shell right before crossing the finishing line. That was happened to me WAY too many times! Hehehe Amongst other things. If there is balance in this game, then that means there has to be NO blue shells. Immense amount of rage was caused because of those damn things! The visuals of this game look GORGEOUS! It's so appealing to the eyes! I'm also glad Nintendo went with 60fps on this one! It looks butter smooth! I'm glad they try, but it would mean a lot to a lot of people if there was an option to turn items off in certain modes to really prove who has the best skills. But again, we appreciate all the effort they put into balancing their work. Lets hope it's better balanced. A big part of the problem is so many items require no skill at all. Too many items auto-seek target, or hit the everyone on the track, or automatically keep you on the track. Since items are so heavily weighted to being farther back it means the leaders are being pelted in a nearly endless supply of super items. Another "target player in first" weapon was the insect swarm in sonic all-stars. It was actually nicely balanced because it dropped a bunch of insects on the track in front of the player in first. There were gaps so you could manage to get through unhit, but it could seriously mess up your racing line and you needed quick reactions to get through anything. It's just much better balanced than the blue shell cause it definitely slows down first, but isn't a guaranteed annihilation like the blue shell. Mario kart historically has tried to use items to eliminate skill and that's why it's so often been based on luck. I hope Mario Kart's dev team handles the game balance correctly this time. It's the only thing they ever get wrong. As of late, Mario Kart always punishes the racers with the most racing-skill and rewards the ones who struggle the most. It's frustrating when you know you're good, you've been practicing and playing your hands off, but then you get online only to be pummeled with a huge barrage of items because you're who was able to pull out in front of everyone early on. And once you're pulled back into the pack, you never get out. It's just turns into a huge chaotic item-fest because there are 12 players and FAR too many opportunities to grab items/power ups. So far, the only Mario Kart game with true balance is the SNES Super Mario Kart. It's still my current favorite of the whole series. Don't get me wrong, I love every single Mario Kart game I've ever played and I have really high hopes for Mario Kart 8. But I think the only other Mario Kart game that rewards skilled players (other than the original) is Mario Kart DS. If you knew how to "Snake" you could recover from just about any amount of item pummeling you took from other players. But snaking required some series skills. THAT is how do Mario Kart right. After seeing what they did with Rainbow Road 64 I 100% trust his word. @Mochtroid heh snaking was hard enough in time trials, it really got special when you were under constant assault from items. After what I've been going thru the past few days w/ DKCTF, I'm sure this will seem fair I honestly don't recall theses games being that hard - and I played MKWii w/ the wheel - until I got to mirror mode, whch I just view as "challenge mode" so it should be difficult. MNR story line was a lot more difficult. Looking forward to this one, blue shells, fairness, whatever, I predict it will be good. I also have the advantage of not playing 7 so alot of this will be new to me. That piranha plant, just wow. I don't mean to be one of those spec jerks, but anybody know if this is supposed to be 720p or 1080p? The video first came up in 360p and it looked so horrible, had me worried, changed it to 720p and it looked great though. Just wondering more than anything else. @rjejr one problem with the AI in mario kart is that it's not actually designed to race all over racers on the track and try to win, it's designed above all else to stop the player from winning. You see numerous times the AI entirely avoids other racers in order to target the player. They'll even save items specifically to target the player. I've had many many times in MK wii where I got hit with a blue shell inches from the finish line on lap 3 and ending up coming in dead last place because the entire AI ensured I couldn't cross the finish line. This wasn't a one time occurrence, it happened all the time on harder modes. That kind of junk really contributes to the luck factor and cheapness of the single player modes. Super Mario Kart is the only fair Mario Kart game. Mario Kart 64 was fun with other players/friends. Advance was good, but I never got to play Multi-Player. Wii was Brutal as was DS an 7 is nothing more than a badly done clone of DS. Seriously, there was nothing new in the game. 8 looks like it'll finally be fun again! @Yorumi - Yeah it was! In the beginning, I hated coming across Snakers online. But I quickly acknowledged that these were skilled players and that in order to beat a skilled player, you have to become skilled yourself. And so I learned. It was hard, even harder to do online. But but it paid off! I though every Mario Kart game after DS would take this kind of approach. At first I thought the N64 one WAS the new one in the trailer because it's so unrecognizeable!! Can't wait to see the new one, along with the new Bowser's Castle. May 30 could not come any sooner!!!!!! Everything about this game is great! Random or not, the point that people are making with the items is that they want their experience to be free of outside factors that decrease their standing. If skill alone is not enough to win races, there's something wrong with the game's design. @Jazzer94 For sure! I can't wait for the reveal/playing it myself on launch! @Bolt_Strike it's actually about striking a proper balance. When any items exist at all you automatically introduce a luck factor. So luck will always play some role, but player skill should play a much bigger role. Items should bridge the gap between players who are not necessarily equally skilled, but at least somewhat close in skill and keep things somewhat interesting. Unfortunately at this point skill is almost actively punished in MK games so hopefully that'll change with this version. The recent games have been ridiculous and have stopped me playing in frustration. I just don't understand why people should be punished for being good and in the lead! I sure am Pumped for this game! It sounds like they're trying to make the game more fair, while not driving away the casuals. 1. Daisy and Funky Kong were so much better than everyone else in Mario Kart Wii all the luck based items didn't matter so much. Pay attention to balance on characters too. 2. Please stop putting INVISIBLE and INCORRECT stats on the characters and vehicles. Why are you intentionally misleading players? I shouldn't have to go to a wiki to see what a character's and vehicle's stats really are. 3. Yes the new Rainbow Road is visually gorgeous. @Kaine_Morrison Lol nothing new in 7? Gliders, underwater driving, customizable karts? Ring a bell? Blue shell strategizing is fun. @datamonkey I still think the N64 version is the best, I do agree the latest entries have all been lessons in frustration. To the point I never, ever, want to touch Mario Kart 7 again. Just get rid of the cloud and you'll be gold. Honestly have never had a problem with Blue Shells....unless its at the very end of the race when I'm about to pass the finish line! The fact that the Spiney Shell is in instead of the Flying Blue Shell also makes me happy. Yeah right. As long as the blue and red shells exist, Mario Kart will always be about luck. Nearly all power-ups are built around harming opponents instead of actually boosting the player's own performance. @Yorumi I honestly had no problems playing the Wii single player mode, I didn't get all the 3 Stars like I did on 7, but I did fairly well. I only ever had that occur to me once. @Phantom_R I have absolutely no problems with Red Shells since they can easily be blocked by bananas, green shells or making super sharp turns. @Mommar - Yeah MK64 is also better balanced. Keeping my fingers crossed that MK8 won't be so frustrating! Umm in all fairness how can they preach balance yet have a blue shell in the game. They said they don't want to be about luck, but in the end it is just that, being lucky someone isn't holding one until the moment you cross in first and instead come in last. Sadly the most balanced Mario Kart still is the one without it. All the other items that'll lay you out like the other shells and bananas can be blocked, but the blue shell is just cheap death from above. Now if they'd allow finally an option screen to customize play where that blue shell could be disabled, that would open the game up to the best balance possible with the greatest level of even and fair challenge. I've ditched a good many versions of the series with MK7 up on ebay right now as they don't keep my attention long anymore and the blue shell is a good part of the problem. I'm really wary about 12 racers, that trailer showing an item onslaught, Slipstream, AND Coins. Not to mention the Trick Boosts and the various forms of off-roading. I don't mind a complicated MarioKart, but this seems like too much. Here's hoping the balancing is good this time, especially no matter what character you use (looking at you, Metal Mario). @Bolt_Strike every kart racer i have ever played has had power up's. wheather made by sony, square, rare, or nintendo. these are not standered racers. hold off for project cars if thats what you want. @tanookisuit holding a blue shell for an entire race and forgoing all other power up's is a strategy. i hope he keeps his words about it. Mario Kart Wii basically punished you for being in the lead it seems. They just have to balance out the Blue Shell really. Mario Kart 7 seemed to take things in the right direction but something else needs to be done. Very excited to see how the new Rainbow Road turns out in other news! @Rafie I Is it May yet? @Phantom_R Banana ' s exist for Red Shells. And being hit by Blue Shell can be overrided by boosting quickly after. The biggest boost in balance would be making all the characters built around one another. @PrincessEevee9 Boosting to dodge a blue shell is extremely difficult and only possible in a few games. Otherwise it requires a mushroom and still perfect timing--which also means you might not have a defense against red shells. The main problem is that red and blue shells are skill-less, effortless, and hardly rewarding at all. Meanwhile power-ups like mushrooms and stars will reward the players for their creativity, often without having to ruin the fun for another player. I'm looking forward to Rainbow Road. Thought the N64 version was always the best one as the newer ones just dogged you with jumps that would lead to people falling with no walls or rails out there to help. Really glad to hear this. I truly disliked Mario Kart Wii, and the broken rubberbanding system was the main reason why. All this “balance” stuff has not been doing this series any favors as far as I'm concerned. I prefer the randomness of old. Hmm... I approve of this game. Reading this, it sounds like it will be more of the same then. The exact problem with the power ups is thay they AREN'T random. They are deliberate. The guy in the back will always get the super power ups and the guy in front will always get banana peels or green shells. Thats the whole problem! So him saying that the powerups are not random just tells me its more of the same. Game designers taking the skill out of a racing game. True randomization of the power ups will remedy the problem most players are saying they have with the game. But, it will create imbalance between good players and bad players. So do what most people on here are saying, make different game modes, "Advanced" where powerups are randomized and "Balanced" where powerups are not randomized. At leeast players can then play competitively or just for fun with a youger sibling or beginner. I also agree with some earlier comments. Get rid of the blue shell or modify it so a truly skilled player can avoid it like the swarm in Sonic All Star Racing Transformed. And give them an achievement for avoiding it too. The game designers can make it tough to avoid. Throw some balancing on there. But make it avoidable so you dont feel robbed if you cant avoid it and drop to 2nd place because of it. Eh...I'm done with the series...so, yeah. Why don't they just have an item toggle like Smash Bros. to turn off individual items? It's time for Mario Kart to offer more options, I think. Wouldn't it be really simple to include an option to switch between place-based items and purely random ones? Wouldn't the entire game be fixed if they included an option to turn off certain items? But I guess Nintendo, huh? Yeah. Nintendo. @AshFoxX Just like you, I never had a problem with balancing issues online. However, I did feel that the precise timing in which I would get hit by consecutive red and blue shells in a way that would allow CPU opponents to catch up to me, was a bit OPed. Nevertheless, I still love the series and I can't wait for May 30. I still have hope that NoA might announce a bundle by the last week of April. @Kaine_Morrison Super Mario Kart was fair? Where the AI can use their special item at any time they like and a feather can shortcut massive parts of track? @AshFoxX I feel the same about the balance issues. Sonic All Stars Racing Transformed, now that's more balanced. No Blue Shell, just an item you can actually dodge. Yes, I would finally like to turn off Blue Shells and Lightning Bolts. What I have seen from gameplay footage drivers seem to recover much faster from damage by items etc. and from falling to pit. That itself decreases the frustration for me and makes the items less effective which is just a good thing. @Janfeae Turning items off was possible in MK7 online communities. I'd wager that this will return in MK8, let's hope so! @Phantom_R I think you have that backwards. Red Shells take skill to use because they don't always hit their target, nor do they dodge obstacles and the landscape. It is about time they balance out the items. Mario Kart Wii was a joke compared to 7. The blue shell was relentless in Mario Kart Wii. Anyone else notice that Luigi is getting a bit mean with Mario at the beginning, there? Maybe the old boy is getting some confidence, with his own special year, and all. Being in 1st place and being hit by a blue shell, more like 6 items within seconds of each other. That's bad luck because it's programmed into the game. On the SNES, N64 and GBA, it was balanced. Can't remember how it was balanced on the GC, but on the Wii, it was painfully unfair, but not so much on the DS and 3DS. I hope things have changed with the Wii U. You also have to consider younger gamers, as Mario Kart 8 is rated 3+. Nintendo talks trash sometimes. As if they don't understand their own games. They don't need feedback from gamers. It sticks out like a sort thumb that the balance has been wrong for years. I've never understood why MK games didn't have an option menu for items. Hate blue shells and lightning? Turn them off. Problem solved.